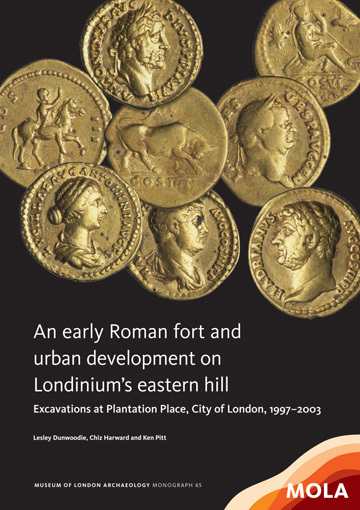 This publication details the discovery and excavation in 1997–2003 at Plantation Place of a previously unknown Roman fort, on the edge of the early town. Built c AD 63 as a direct response to the sacking of Londinium by queen of the Iceni, Boudica, in AD 60/61, the formidable earthwork and timber fort secured the area against further attack and created a base for reconstruction of the devastated town. A large collection of military artefacts included plate armour, fittings and part of a cavalry helmet. The fort was cleared c AD 85, making way for civilian domestic and commercial buildings. A hoard of 43 gold coins from AD 173–4 was found in a masonry townhouse, part of the redevelopment of the area after the Hadrianic fire of c AD 125. The history of the fort and its surrounding area, before and after the fort, are detailed here.